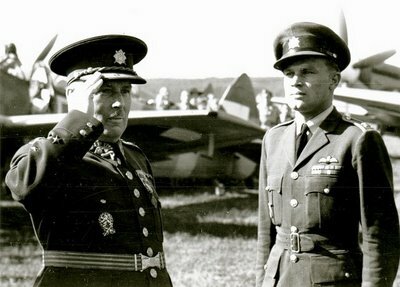 Czech pilot Sqn/Ldr Jirí Manák, during the official return ceremony of No. 312 Squadron in ?eské Bud?jovice, 1945. These two photographs show Czech pilot Sqn/Ldr Jiří Maňák during the official return ceremony of No. 312 Squadron in České Budějovice, 1945. 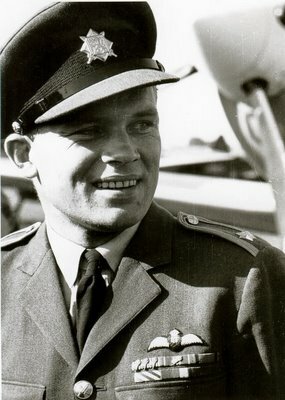 Jiří Maňák was an exceptional pilot. He was one of only a few Czechoslovak airmen who flew Hawker Typhoons, serving with No. 182 Squadron until April 1943. Promoted to the rank of Squadron Leader, he was later posted as a commanding officer of No. 198 Squadron. He led this unit until August 1943, when he was shot down off the Dutch coast and had to land his aircraft on the water. Allegedly, he was one of only three RAF pilots who survived the ditching in Typhoon. He was subsequently captured by the Germans and spent almost two years as POW until liberated by the British Army. Upon his return to England, Maňák joined the No. 312 (Czechoslovak) Squadron on Spitfires and returned with this unit to the homeland. He was the first pilot to touch down at the squadron’s new peacetime base, ?eské Bud?jovice. At the time, he was flying Spitfire LF IXE, TE566 (DU-A). His career at České Budějovice was rather brief. Later in 1945, Maňák moved to VLU Air Research Institute in Prague-Letnany where he was employed as test pilot. He flew a multitude of aircraft types including Czech-produced Bf 109s (S-99), Me 262 (S-92), Spitfires and many civilian types. He gained fame for his public aerobatic displays across Czechoslovakia, including low-level aerobatics in a Me 262. Like many returning ex-RAF personnel in Eastern Europe, Maňák eventually fell into disgrace with the Soviet-controlled communist regime of his country. In 1950 he was discharged, imprisoned and charged for revealing classified military information and treason. He was eventually released, but the authorities would not allow him to return to flying. He spent many years working on a river boat. Only in 1964 was he “rehabilitated” and joined Czechoslovak national airline, CSA, as pilot.